Armstrong Clan Society | One hundred thousand welcomes! ACS member William will be hosting the Armstrong Clan tent at the Virginia Scottish Games in Plains, Virginia over Labor Day weekend. Join us April 8 & 9, 2017 for the 2017 Loch Norman Highland Games! The games are held at Historic Rural Hill in Huntersville, North Carolina. Those familiar with the games know the range of activities and events that make LNHG a perennial favorite. 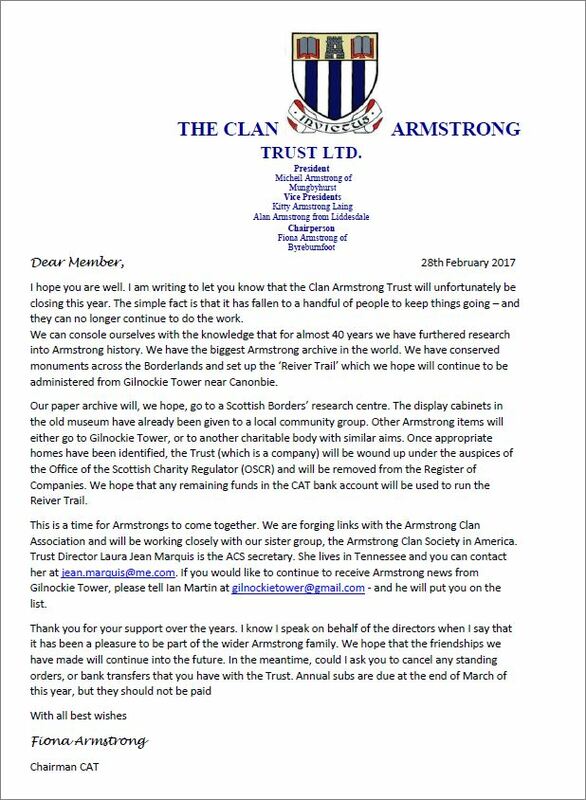 After “nearly 40 years of service” Fiona Armstrong has announced that the Clan Armstrong Trust will close this year. We join with countless friends and followers to acknowledge and thank the members, officers, and directors of the Trust for their work and service. Click here to view Fiona’s full letter for more information. We received news today of the passing of Frank Wherrett. ACS members will recognize Frank as an instrumental figure in the Clan Armstrong Trust. Good morning, it is with great regret that I have to inform you that our Clan Armstrong Trust Company Secretary Frank Wherrett passed away last night. His daughter Fiona was on the phone this morning to tell us, but at this moment I have no further news. I will keep you up to date with the arrangements. We have all lost a great friend! Kind regards, Ian M.
Frank was Chairman/Company Secretary of the Clan Armstrong Trust, and also served as Secretary. ACS secretary Laura Marquis reports that Frank had enjoyed the Armstrong Gathering last weekend, and even took people around the Reiver Trail on Monday. The Annual General Meeting (AGM) of the Armstrong Clan Society will be held at the Stone Mountain Highland Games the weekend of Oct 15 and 16, 2016. For more info see www.smhg.org and future issues of The Armstrong Chronicles. 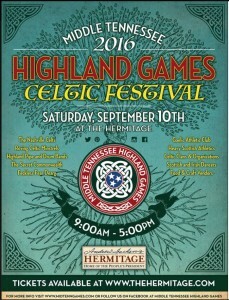 The Highland Games and Celtic Festival is getting ready for the second annual gathering at The Hermitage Plantation in Nashville, Tennessee on Saturday September 10, 2016 from 9:00 AM – 5:00 PM. There will be plenty of music, dancing, exhibitions, games, competitions, as well as food & craft vendors. Scientists now say the Scottish Borderland Armstrong family stems from further north – and from one man. Armstrong males are being asked to take a DNA test to confirm exciting new research. 500 years ago the Armstrongs were the most dangerous family on the Scottish Borderland. And now, it seems, these riders and raiders came not from Southern Scotland, but from further north. Geneticists say new evidence shows that this powerful reiving clan originated in places like Angus, Moray, or Fife – and that all Borderland Armstrongs may stem from one man. Dr Jim Wilson, ‘Scotland’s DNA’ Chief Scientist, has discovered that the haplogroup the Armstrongs descend from originated not on the English/Scottish divide, but in ancient Pictland. Their distinctive Y chromosome rises to above 1% of all men in places like Perthshire, Fife and Tayside – and it arose perhaps 3,000 years ago. His scientific research also points to the fact that the Armstrongs descend from one man: around a thousand years ago, this person moved to the English/Scottish border – and became the progenitor of a great reiving family. How is it possible to be sure? Geneticists can recognize what are known as ‘expansion clusters’, groups of men who carry closely-related DNA markers that point to a common male ancestor. Dr Wilson has recognized just such a cluster in Armstrong men originating in the Borderlands. We know that kings, princes and other powerful men mated with different women in the past. The original Armstrongs must have been able to access several females and were able to spread their DNA widely and have many sons, who, in turn, could repeat the process. An example of this was in 15th century Ireland. Lord Turlough O’Donnell fathered 14 sons and had 59 male grandchildren. If the same level of enthusiasm and fertility were sustained, Lord Turlough would have had 248 great grandsons and 1,040 great, great grandsons. In four generations, the man could have bred an army. This is thought to be the pattern of genetic inheritance that happened with the first Armstrong who came from ancient Pictland to settle in the Borders: the begetter of a great name, and also of men who shaped Scottish history. Highland clans were feared because they formed a family army and fought for each other. Borderland Armstrongs were similar. Their Heidsman could put 4,000 men in the saddle and wherever they rode, to fight, or raid, they were also feared. 1) Seek friendship and unity among Armstrongs and associated families. 2) Provide for the preservation of Armstrong artifacts unique to the family and to maintain a library. 5) Establish geographic membership representation. 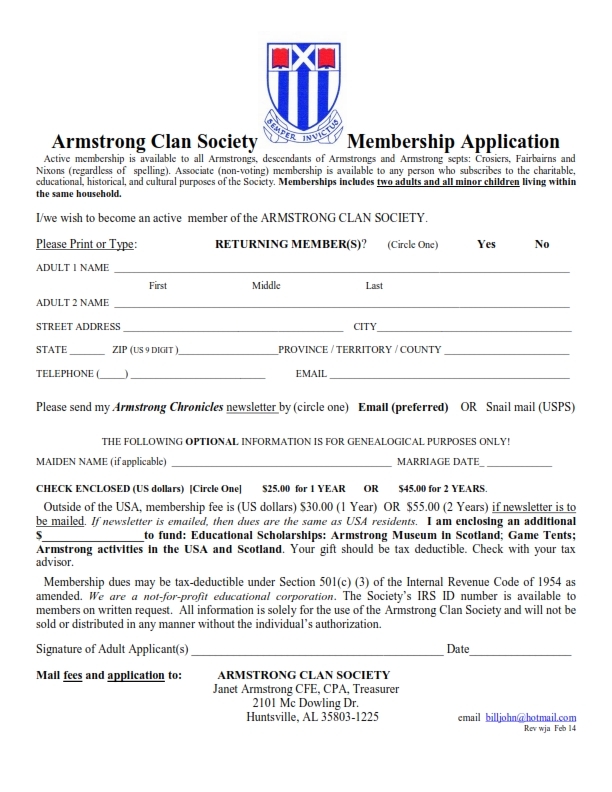 All Armstrongs, Croziers, Fairbairns, Groziers and Nixons, regardless of spelling, and their descendants, are eligible for full membership in The Society. All others interested in furthering the goals of The Society may become associate members. In the United States and Canada, dues are $25 per year, including two adults and all minor children. In all other countries dues are $35 per year, payable in US funds. You can click here to download a membership application.